Mega Sale! Free Shipping Included! Save 29% on the Panasonic MC-UG471 Bag Upright Vacuum Cleaner - Corded by Panasonic at Doctor Joe Says. MPN: MCUG471. Hurry! Limited time offer. Offer valid only while supplies last. Equipped with a powerful yet quiet 12 amp motor, this upright vacuum cleaner provides exceptional cleaning results and improved indoor air quality. 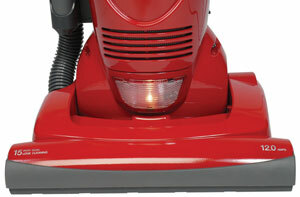 View More In Vacuums & Floor Care. 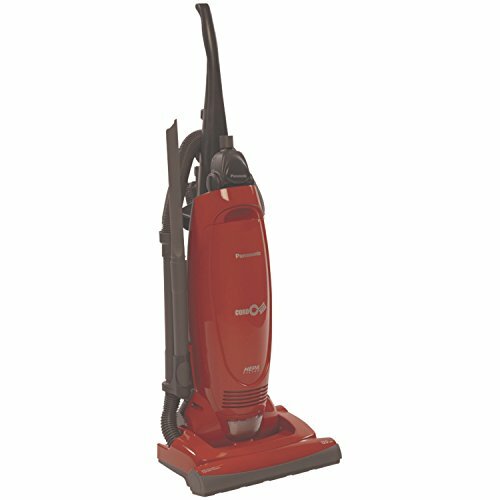 Equipped with a powerful yet quiet 12 amp motor, this upright vacuum cleaner provides exceptional cleaning results and improved indoor air quality. The unit automatically adjusts to the proper setting for just about any carpet height, while its HEPA filtration system captures 99.97-percent of dust, allergens, and small particles, so only clean air gets expelled into the home. The vacuum's motor-protection system channels dust and dirt particles directly into the vacuum bag, promoting long life and more efficient cleaning for the fan and motor. Quickdraw tools rest in a side holster on the vacuum, ready for immediate use. The included stretch hose, two standard wands, dusting brush, and crevice tool ensure fast, powerful, above-floor cleaning. Connect the dusting brush or crevice tool to the vacuum's 12-1/2-foot attachment for easier access to hard-to-reach spots. Other highlights include an ergonomic handle, a foot-step handle release, a headlight, a 15-inch cleaning path, an integrated carrying handle, and a 24-foot power cord. A single touch activates the cord-rewind mechanism, making storage easy and convenient. The vacuum cleaner measures approximately 12-1/2 by 15 by 44-1/2 inches and carries a one-year limited warranty. 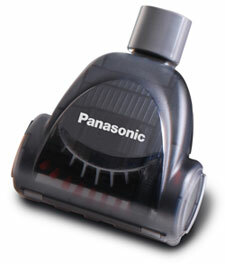 For powerful household cleaning, turn to this 12 amp upright vacuum cleaner by Panasonic. A press of the foot pedal releases the handle, which comes molded for comfort, while its conveniently placed on/off power switch (on the main body of the unit) allows for quick, easy start-ups. The sleek-looking vacuum cleaner provides a 15-inch cleaning path for covering more area in less time and automatic carpet-height adjustment, which adjusts to the correct height for everything from berber to shag. 15-inch cleaning path and illuminating headlight. View larger. Thoughtfully designed, the upright vacuum cleaner's advanced vacuum system channels dust and dirt particles directly into the vacuum bag, which helps protect the fan and motor for year after year of high-quality performance. For thorough above-floor cleaning, the vacuum cleaner comes equipped with QuickDraw tools, which include a stretch hose, two standard wands, a dusting brush, and a crevice tool. As an extra bonus, the vacuum cleaner supplies an air-turbine brush that quickly and efficiently removes stubborn pet hair from stairs and upholstery. A side caddy keeps all the attachments neatly on board for easy access. Convenient automatic cord rewind. View larger. Other highlights include dual-active edge cleaning, an automatic headlight on the front of the unit, a 24-foot power cord for extended coverage, automatic cord rewind, and a HEPA filter that effectively traps small particles such as allergens, irritants, and pollutants. Awarded the Good Housekeeping seal of approval, the upright vacuum cleaner measures approximately 12-1/2 by 15 by 44-1/2 inches and carries a one-year limited warranty. This advanced vacuum system channels dust and dirt particles directly into the vacuum bag or dust cup, which helps protect the fan and motor. Dusting brush for above-floor cleaning. View larger. 12-amp motor offers powerful cleaning performance. A convenient switch on the body turns the vacuum on and off. 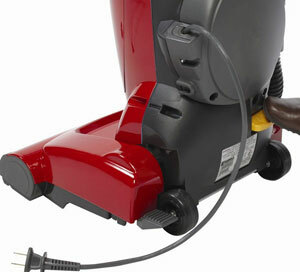 The stretch hose, 2 wands, dusting brush and crevice tool are attached to the vacuum, allowing instant access to powerful, above-floor cleaning. A light touch activates the automatic cord rewind. 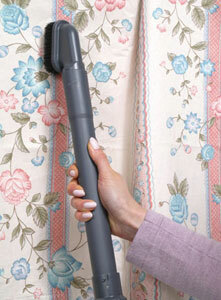 Air turbine brush for removing pet hair from stairs and upholstery. Automatically adjusts to the proper setting for just about any carpet height. Quickly remove stubborn pet hair from stairs and upholstery with this handy on-board attachment. The HEPA filter captures small particles such as allergens, irritants and pollutants. The headlight on front of unit turns on automatically so you don't miss a spot. A 15" wide nozzle lets you clean larger areas in less time. If you have any questions about this product by Panasonic, contact us by completing and submitting the form below. If you are looking for a specif part number, please include it with your message.